Boeshield T-9® was developed by the aeronautical experts at Boeing as a waterproof lubricant for aircraft components. And, as it turns out, this mixture of solvents and waxes translates pretty well to the world of bicycle maintenance. T-9 is wet lubricant that dries into a waxy film that clings to metal and repels water for months. Frees rusted and corroded parts. Use it on your chain, cables, derailleur/brake pivots and springs or any other part in need of waterproof lubrication. 4 oz squeeze bottle. I've tried a few different lubricants for my chains over the years, all of which worked fairly well. However, I have found T-9 to be the best one for my use, which consists of road riding for fun and for commuting. I don't encounter all that much dirt and gravel along my routes, but I still find that my chains can accumulate a lot of gunk quickly. What makes T-9 more effective is that it doesn't seem to attract dirt nearly as much and my chains stay running smoothly. As my headline suggests, I'm familiar with some of Boeing's other product offerings, and I always find them to be carefully engineered and the best of their kind. Enthusiastically recommended. I used to use Prolink, and I've found this attracts less dirtgrime year round, so I prefer this brand now. This product continues to perform. I've ridden for more than three decades and have tried numerous lubes. This is smooth and durable. Only chain lube I use! I only use this lube on my chain, use the other lubes i tried on all the other drive train parts. I like the way it applies, stays on and cleans up, most of all a quiet chain. Ia'm a fanatic about a clean, quiet chain, wipe chain, put this on each link, wipe next day, wipe down after every ride. T-9 is the only chain lube I use year around. This isn't the cheapest chain lube, but it keeps my drice train running smooth and quiet regardless of the weather. Loud, does not last long (e.g. I have to reapply every 100 miles) and even when fully saturated, it does not work as well as Chain-L, Prolink Gold or Clean Ride. Stay away. What's good for airplanes (Boeing) is not good for a chain. works like a charm right through the mpls winters. Used this lube for many years with good results. Long chain life and ease of application. I reapply ever 200 miles. Used to amateur race and the team would always tell the wrenches If its not Boeing, I'm not going. Switched to Dumonde Tech for a year a few years ago at the insistence of another rider that it was so great-and it was a big mistake, gunked up my dura-ace drive chain requring a heavy duty tank soaking to get it back to normal. Remember If it's not Boeing, you are not going. Boeshield is not recommended for cyclists that spin faster than a turbine engine. I've been using this chain lube for years and it's the only one I use. It works great! I've been using this chain lube on my $3000 rode bikes for years. It's the only one I buy. I read about it in Bicycling Magazine years ago, tried it, liked it and haven't used anything else. Price is a little on the high side but it's worth it. Keeps chains clean & quiet. I wipe down my chain and lube with T9 every 100 miles. This keeps the chain quiet and the last chain didn't register any wear after 5000 miles (using the Park CC-2 chain wear tool). After letting the oiled chain set for an hour it gets wiped to remove the excess oil & grime leaving a nice shiny, clean and quiet chain. I commute to work. Sun, rain even a bit of snow. There's always grit, gravel and road debris being kicked up into my chain, gears and hubs. This lubricant works great. I've tried others, but nothing compares to its lasting power and ease of application. I've trusted T9 for seven years, 16,000 miles and wouldn't use any other. This lube lasts a long time, does not attract dirt, works well in wet and dry conditions and keeps the chain running smoothly. I've been using this chain lube on my bike now for over a year. I like its consistency. It does attract quite a bit of dirt which means for more cleaning overall, but that's something that should be done anyway. When I've just lubed everything...it's like butter. Also, despite the increase in re-lubing, I still haven't used my first bottle...over a year later. T-9 is the best solvent on the market, it cleans and lubricates and keeps me rolling. 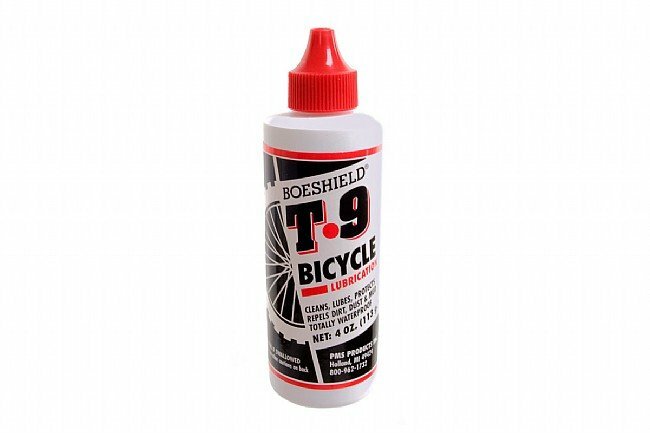 I use T-9 every few days on my chain and other bike parts and then forget about it because T-9 takes care of road dirt and drying out of cables and other parts. I have used it for a long time and this small container is easy to carry and handy to use on long rides or tours. I love it.